Among the many aspects of old school gaming that the OSR has brought into sharper focus is the notion that resource management is an important part of playing Dungeons & Dragons as it was originally conceived. This isn't just ivory tower theorizing either; it's something that the older rulebooks emphasized both directly and indirectly. It also squares with my remembrance of how we played D&D back in the day, when keeping track of just how many iron spikes your character was carrying or how long your torch had been burning could mean the difference between life and death. It also meant keeping track of encumbrance -- something I've never enjoyed. I did it, of course, because the rulebooks said you were supposed to do so, but I didn't like it; I still don't. It's one of many ways in which I am a less than ideal old school referee. It's also one of the reasons why I've been hoping to find an alternative to the various persnickety approaches to encumbrance found in the various editions of Dungeons & Dragons. The closest I have seen so far is the system presented in Lamentations of the Flame Princess, which tracks not weight but the number of items, the rationale being that "encumbrance" is as much about bulkiness as it is about weight. Tracker Tokens from Faster Monkey Games (no designer is listed) employs a similar line of thought, but with the addition of a simple graphical interface to facilitate the tracking of a character's equipment. 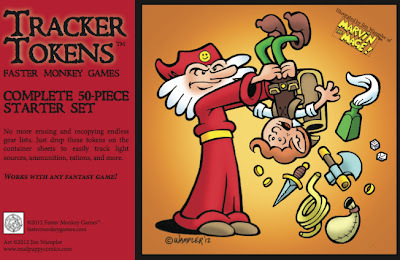 This interface consists of two cardboard container sheets and 50 cardboard tokens, both illustrated in full cartoonish color by Jim Wampler of Marvin the Mage fame (about which I've spoken before). These sheets depict several different types of containers -- backpack, quiver, sack, bandolier, and small and large pouches. Each type can hold a certain number of items, ranging from 25 for the backpack to 1 for a small sack. Don't worry about exact weights or sizes: when a container is full, it's full. The referee decides how much is too much to carry, and can collect used tokens or hand out new ones as supplies change. There are thus no rules associated with Tracker Tokens; it's just a tangible way to keep track of the fiddly little items that many lazy players and referees -- like me -- would otherwise not keep track of. In that respect, it's not so much a replacement for an encumbrance system so much as a way to get a handle on how many arrows or flasks of oil a character is carrying. The only drawback, of course, is that every players needs a set of Tracker Tokens for himself and, while the product isn't expensive -- $7.99 -- it is an additional purchase, meaning that not every player will want to buy them. That cavil aside, I really like the idea behind Tracker Tokens and can imagine using them at my table. Yes, it could be called a "gimmick," but I don't think that's necessarily a bad thing. Often gimmicks are just what players need in order to be encouraged to pay attention to things they might otherwise overlook -- like whether they brought enough iron spikes to nail those double doors shut before the rampaging minotaurs squash them. Buy This If: You'd like to make keeping track of adventuring supplies easier with the use of a simple graphical interface. Don't Buy This If: You think pencil, paper, and a good memory are all you need to remember how many torches your character has. And I have a copy of one of their other products "IN THE SHADOW OF MOUNT ROTTEN" which I can recommend. I really enjoy encumbrance actually, but dislike most encumbrance mechanics. The closest I have seen so far is the system presented in Lamentations of the Flame Princess, which tracks not weight but the number of items, the rationale being that "encumbrance" is as much about bulkiness as it is about weight. Swordbearer was another game to take this approach. They had a pretty elegant encumbrance system, and also an interesting wealth/social status system, which worked together to make equipment management a lot less fiddly. RuneQuest also had a simpler system for encumbrance, with most things being 1 or 2 ENC. Something you could hold in one hand was 1 ENC. What I don't like about any kind of tokens to represent resources is the handling time at begin and end of session. I tried Monopoly money in a Top Secret game once. It was fun for a bit, but then a bit annoying. I had to have a baggy for each character to keep their money between sessions. I think the idea of tokens to help with encumbrance had been tried back in the 70s or 80s. I remember a review in Different Worlds. I did use tokens for backpacks in one game, if you dropped your backpack, you put your token on the battle map, and then we knew you had dropped it, and where it was if someone needed a potion, or the battle went sour and you wondered if you had to abandon your pack to retreat. I'd have introduced Strength limits for equipment (ie, you need to be this strong to wield a weapon or wear that armour) a long time ago except in D&D there is no need for it, as most people play the class most appropriate for their characteristic roles, and most fighters (which is where the problematic heavy weapons and armours tend to be located) end up being relatively high strength. And players that want to play against class usually put their own restrictions on what they use that tend to be more restrictive than I would impose. Outside of combat is where stuff gets interesting, especially since the more you carry, the less ready you are for combat. Slung shield and helmet, backpack - here the important thing is it takes time to dump this stuff and ready equipment. Marius' Mules (aka Roman Legionnaires) can get away with carrying what they carried because they marched en masse, with scouts to prevent ambush. Players don't have that advantage. So you still come back to the best idea that leaving you equipment somewhere else is the best doctrine. Saddlebags, or preferentially a mule or pony. Ideal. At which point you start to realise that you really need to hire some peasants to look after the animals ... and think, what about porters, torchmen, and even the possibility of a base camp with hot food and maybe even baths. And so the retinue is born again. Much easier for all concerned.